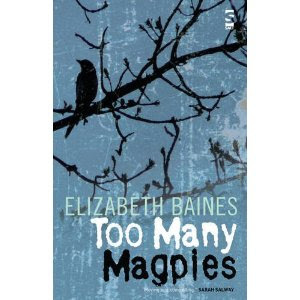 Today I have been reading Elizabeth Baines's 'Too Many Magpies'. Just as I admired Elizabeth's anthology of short stories 'Balancing on the Edge' I am delighted to say that I admire this novella just as much. She really does have a wistful, compelling style that keeps me turning the pages. I think in all good writing, no matter what sort, there is a recognition of truth, and it is certainly here again in this story. As you can hear from this second excerpt read by Elizabeth, the story is about a young mother who feels herself bewitched by a man that she meets. She seems to be drawn to him despite herself, and there is a constant sinister edge to the descriptions, cleverly involving folklore about birds with their connotations of magical spells. The terseness of the short stories is still there, but so too is a sustained menace which reminded me a little of some of Alice Hoffman's writing. Just as in her anthology, the protagonist seems to be balancing on the edge. She constantly struggles against her need to be a good mother, as well as a wife and lover. The Ancient Greeks recognised the end result of such internal conflict and Elizabeth Baines the resulting mental trauma convincingly and empathetically. You can read an interview with Elizabeth Baines here. I read a review of Elizabeth's book on Jim Murdoch's blog, The Truth about Lies, both a thought provoking review and by the sound of things a powerful book, one I've yet to read, but I shall. I'm new to your blog, Claire and very pleased to meet you from Australia. I see that on your other blog you also write from the pov of a Tasmanian devil. Fascinating. Hello Elizabeth. Yes, just read Jim's review - thought-provoking as you say. It's interesting to see a completely different take on a book, and glad to read Jim's very detailed thoughts as he read because it makes me think about the book again. Once I started 'Too Many Magpies' there was no way I could bear to put it down; I thought the way time was handled was quite masterful; and the characters so convincing I found myself empathising with them almost immediately. As Jim says, we all have different opinions - I suppose that's what makes the book world so richly varied.